Motorola Charm listed at Best Buy for $249 | Android Blast! The Motorola Charm has shown up on Best Buy's website, but there is no expected ship date yet. 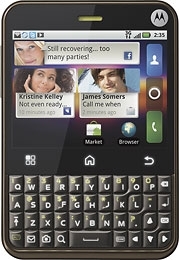 The retailer is selling the QWERTY Android device for $249 and has a "coming soon" button below the price. Hopefully you can pick up the Charm for $250 without a contract, but that remains to be seen. "Built-in GPS capability and a 3.2MP camera with video capture allow this mobile phone to help you make your way to your destination and record your surroundings. Keep in touch with friends and colleagues with built-in Wi-Fi." Click the link below to head over to BestBuy.com.